Belanglo State Forest is a forestry plantation of exotic radiata pines in New South Wales Australia. It is famous, unfortunately, for a series of murders but is also a popular recreational area and a great spot for wild mushroom foraging. The New South Wales Government owns the plantation and planting started back in 1919, today the forest covers some 3,500 hectares. 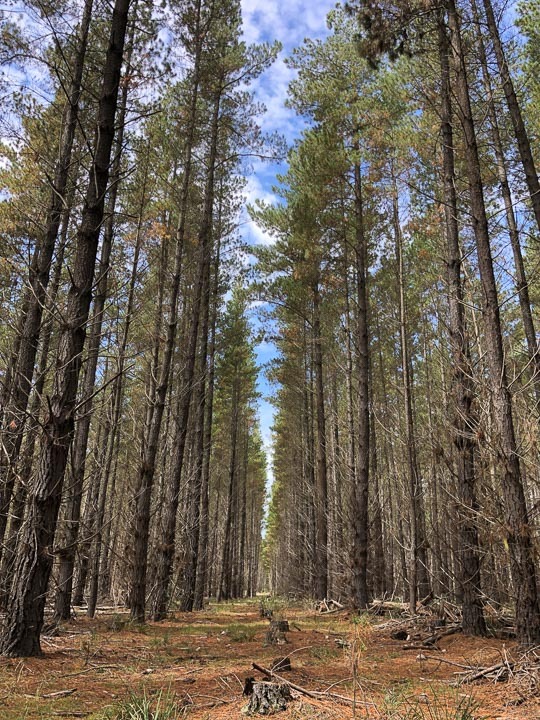 The Belanglo State Forest is south of Berrima in Australia’s Southern Highlands, three Km west of the Hume Highway. This is the road that connects Sydney and Canberra. The public can enjoy four wheel drive tracks, bike trail riding and camping. 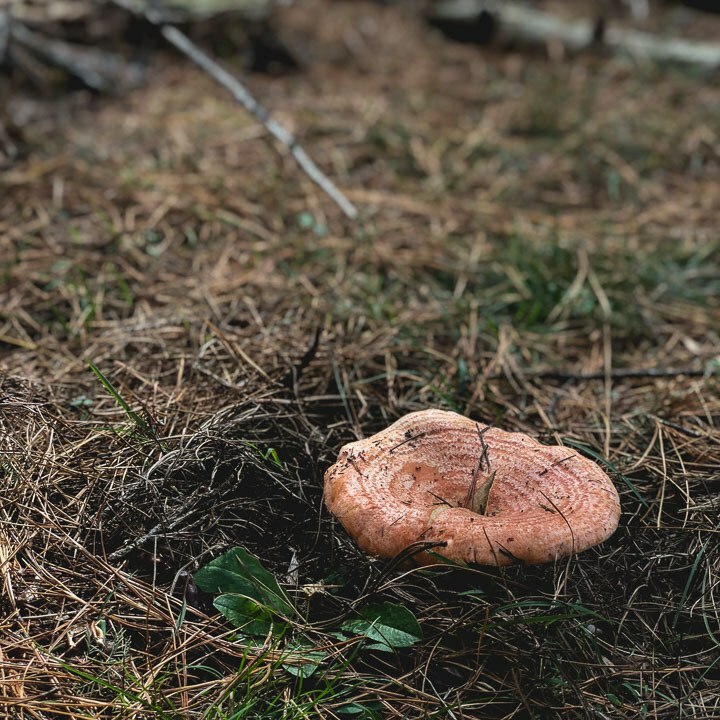 What Equipment do You Need for Mushroom Hunting? In the late 80s and early 90s there was a string of murders in and around Sydney. The bodies were discovered in Belanglo State Forest. The backpacker murders were carried out by serial killer Ivan Milat. Seven missing young people’s partially buried bodies were disciovered here, 15 kilometres south-west of Berrima. The young travellers were German, British and Australian. Milat was convicted in 1996 and is currently serving time at Goulburn Prison, a high security facility in NSW. 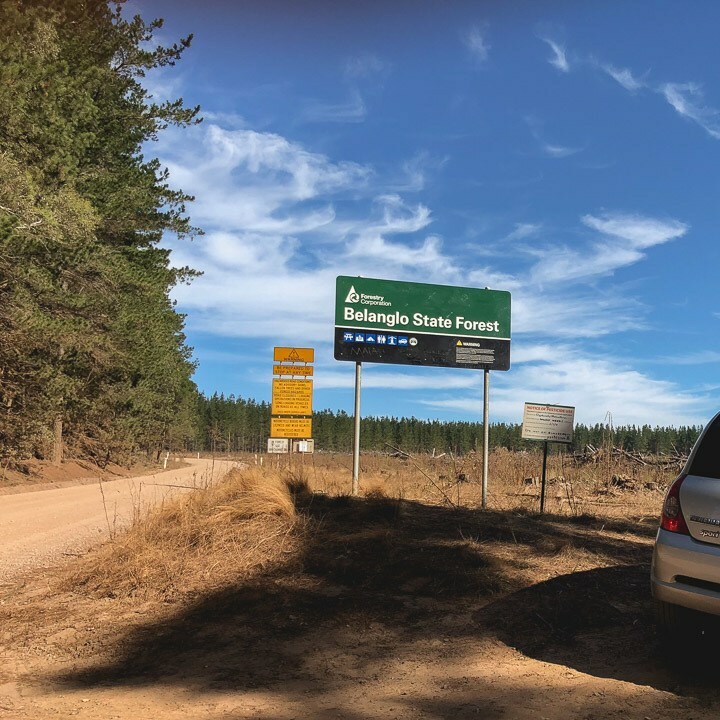 Getting to Belanglo State Forest is easy, jump on the M5 / Hume Hwy and head towards Goulburn for about an hour, then turn right onto Belanglo road. Follow this for 15 minutes into the plantation and then decide on where you want to park and look for mushrooms. 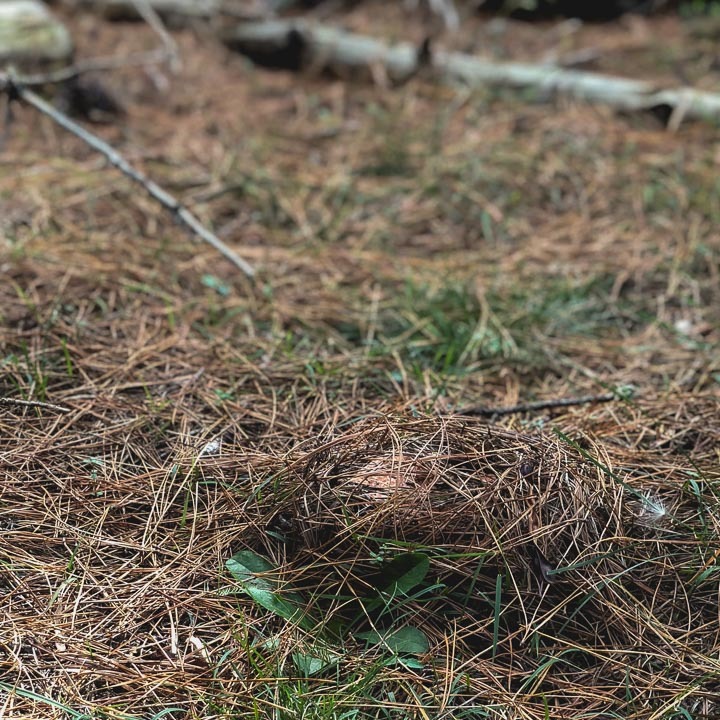 You want to aim for older and larger Pine trees, as these are the ones that have been there long enough to drop a good amount of pine needles, providing the cover that mushrooms need to grow. 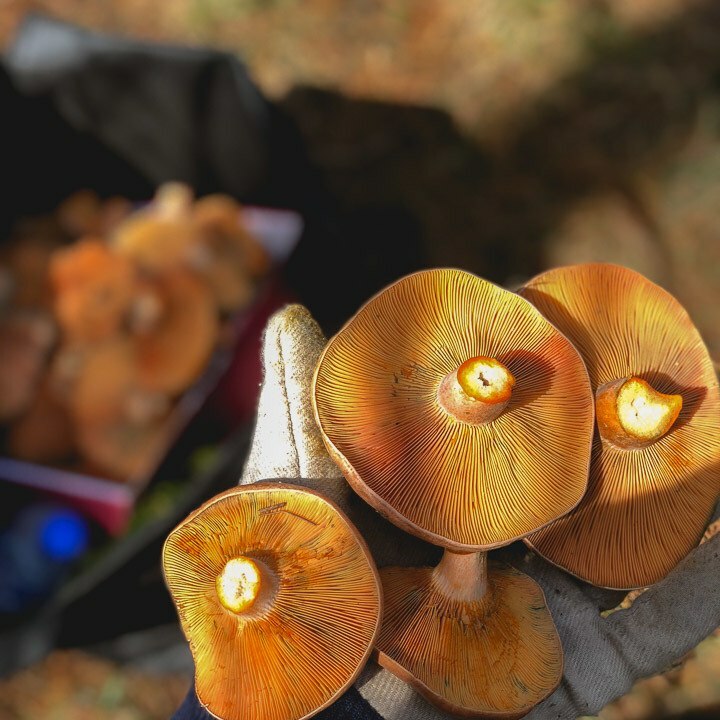 Saffron Milk Caps, grow under layers of pine needles. You can find them during the months of March through to June, at least a week after constant heavy rain. The Meat and Livestock Australia website shows rainfall history over the last 7 days, so it can be a useful resource when checking how much rain has actually fallen. In addition to mushrooms, once you’re parked and walking through the pines, the forest is quite beautiful and serene. If you live surrounded by constant noise and with eyes on your screens, a wander around the forest can be very therapeutic. 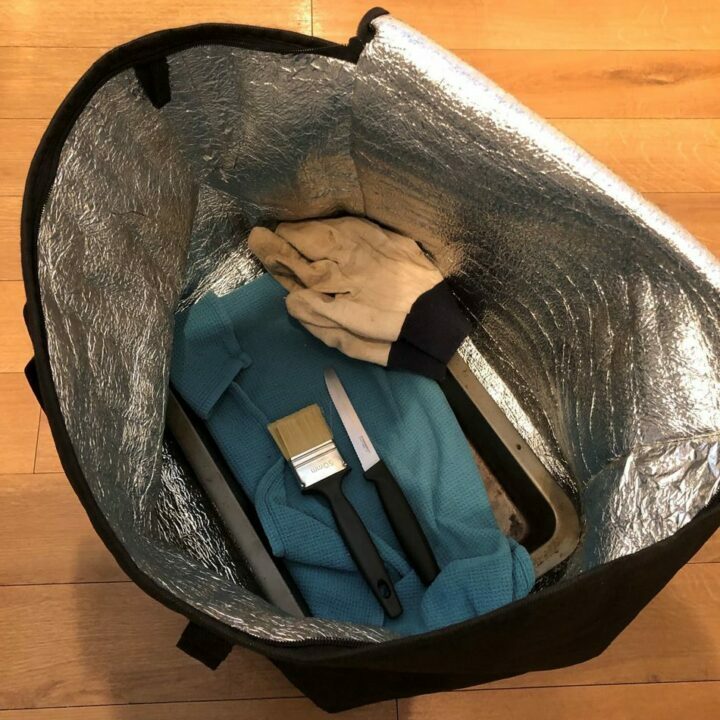 I bring a pretty basic kit with me, that comprises of a large square cooler bag, with a tray in the bottom (to keep it flat and open), cheap cotton gardening gloves, a small sharp serrated knife, a paint brush, a couple of tea towels, water bottle, snacks and a first aid kit with a compression bandage. (just as a precaution for spider, snake bites or an unlikely fall on the flat ground). The forest is accessible by normal car and is flat graded gravel. You don’t need as 4WD, however some of the crossings and turn offs have water channels, so require some basic driving skills with approach angles. This is a working forestry plantation though, so be sure to be aware when driving with headlights on. You can pull over wherever is safe and out of the way. I leave everything in the car, heading out with my gloves on, carrying my bag with the tray, knife and paint brush (for brushing dirt and debris off the mushrooms). A good place to find the milk caps is around old fallen branches and tufts of grass and generally anywhere that there is a good cover of pine needles. The key is to slow down and just have a close look. Even though they’re bright orange, they can be quite well hidden. It will bring a smile to you face when you think there’s nothing around and a minutes later you’ve found 5+ mushrooms all within a couple of metres of where you were standing! I can’t stress enough the importance of identification. You must go with someone who’s experienced and can help identify them. Please do your own independent research and if in any doubt, leave it alone. Belanglo State Forest does have many types of inedible / poisonous mushrooms and fungus. Do not use this post as your only guide. Notice the tiny green gill bruising on the bottom mushroom? 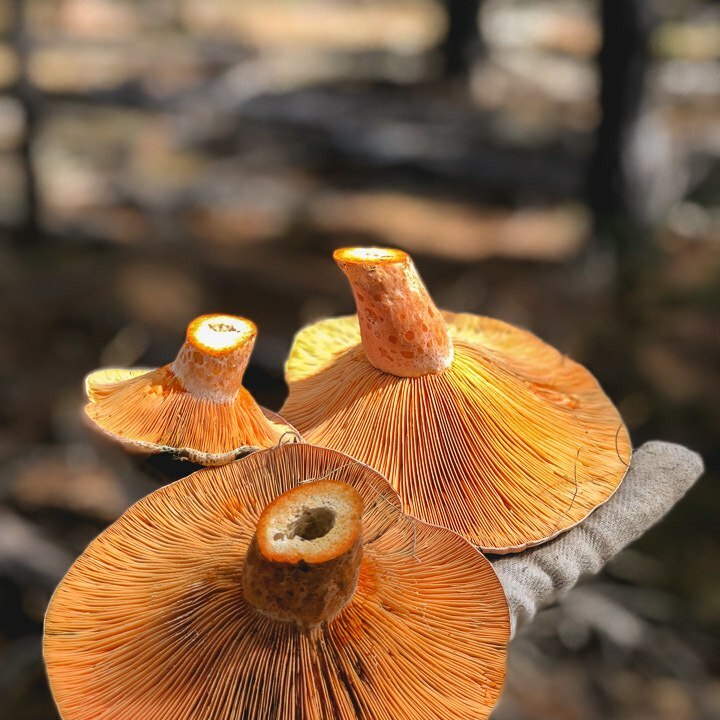 When you find one, brush away the pine needles with you gloved hands, take a look at the identifying features, predominantly the colours and orange pits on the stem, then cut it with your knife at the base, above the dirt. I then carefully hold it and give it a good brush with the dry paint brush and lay it upside down in the bag. You’ll see the latex appear as soon as you cut it, and some that you pick might have been bruised already, showing some signs of green bruising. Mushrooms will keep for a few days in the fridge, but are easy to damage and can take up a fair amount of space. It’s good practice to only take what you will use from the forest if you’re having great success. You can dry or pickle them but I’ve never done this as it’s time-consuming. I tend to just take what I can cook and eat over the next few days. Method: They take longer to cook than standard flat or cup mushrooms. I get a skillet nice and hot, add in the oil and then saute the Mushrooms. 10 minutes or so later, I’ll add in the rest of the ingredients for a few more minutes, then serve over crusty bread. This recipe is intended as a guide only. You’re not Dying! Don’t be alarmed if the toilet bowl looks like something from a Kubrick film, this is a normal side effect. There is one other species of edible mushroom in Belanglo State Forest, which is the Slippery Jack. These arrive later in the season. 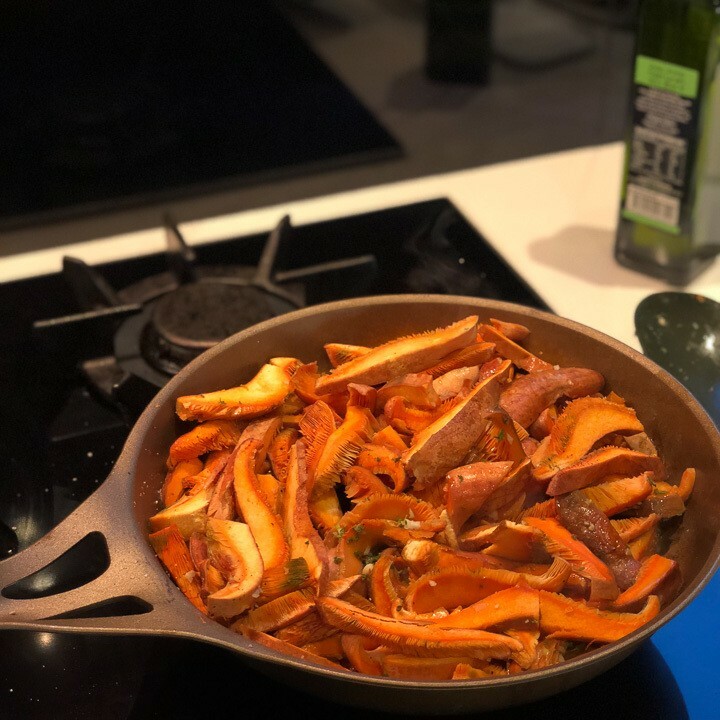 If you don’t eat anything but Saffron Milk Caps, then you have nothing to worry about. Be 100% sure of your mushroom identification process and if in doubt, don’t pick it. Best not to go alone. Keep your phone on you and tell someone where you are going and when you’re expected back. Daley’s Clearing is a popular camping and picnic area within the Delanglo Forest. 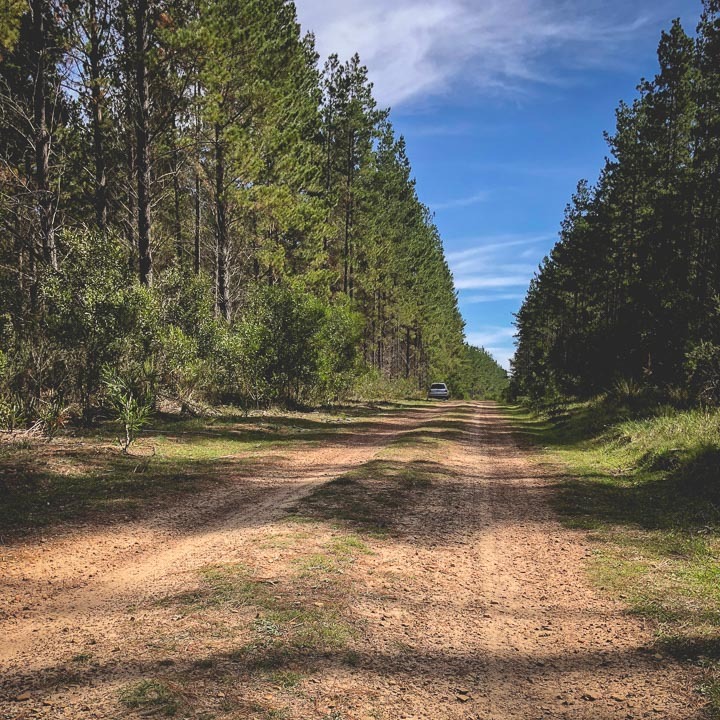 Belanglo State Forest is a popular recreational area and a welcome escape from city living for Sydneysiders. Get out there for a few hours or a weekend and enjoy the great outdoors, maybe come home with some tasty natural food too.